Dorsal side (top by Angeleen Olson, left by Gillian Harvey) and underside (right, by Thalia Christou) of a leopard dorid. This nudibranch is aptly named, as the brown rings that usually dot its body create a definite leopard-print look. There is some variability in the number, size, and appearance of these markings, however: there may be many or only a few, the rings may be filled in thus making them more spot-like, or they may decrease in size to small dots. Occasionally they are absent altogether. Regardless, the base body colour ranges from white to pale grey or brown, or even yellow. This animal's dorsal surface has very fine tubercles, giving it a slightly gritty texture. It can reach 7.5 cm long, is an elongated oval shape, and is surprisingly solid to touch - especially in comparison to more diaphanous nudibranchs like the white-lined dirona and the opalescent nudibranch. 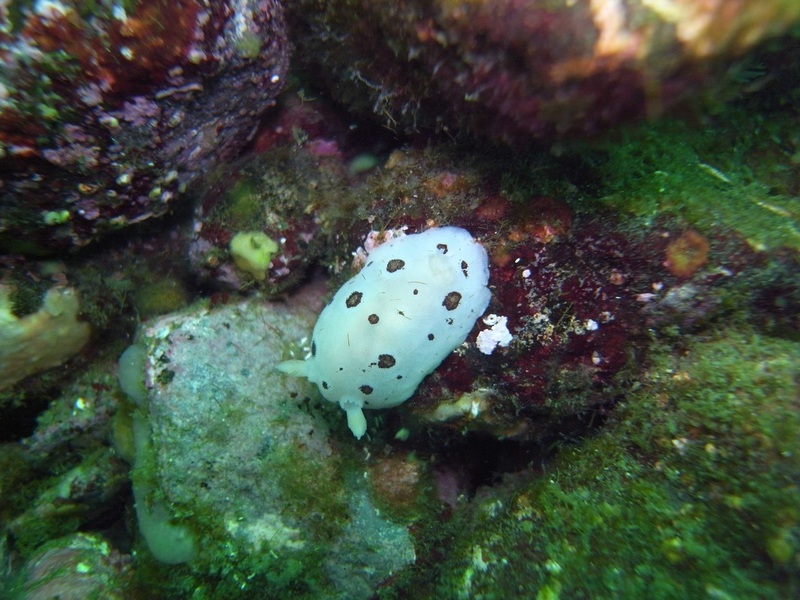 More photos showing this nudibranch's variability can be found by searching for the species in the CalPhotos database. 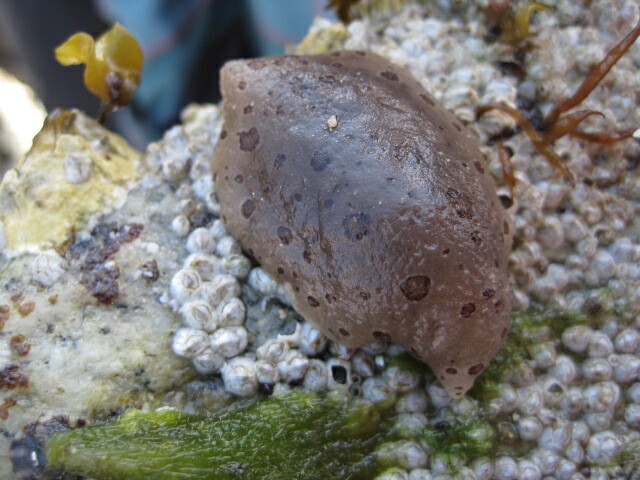 This intertidal species can be found all along the west coast of North America, from Unalaska Island in the Aleutian Islands to Baja California, and also in Japan. It is commonly found in rocky areas and surge channels. 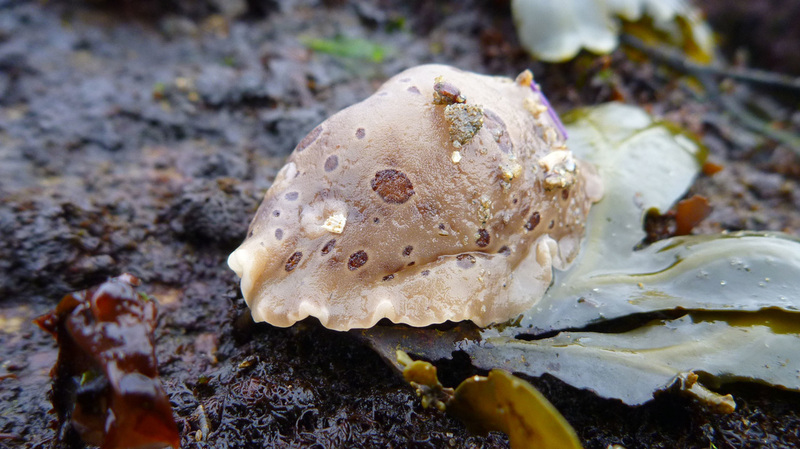 The leopard dorid may be found grazing on a handful of sponge species that are its key food source — purple encrusting, yellow-green encrusting, glove, and orange finger sponges. When its rings are reduced or absent, the leopard dorid could be confused with similar (and also variable) dorid nudibranchs such as Heath's dorid (Geitodoris heathi) and the giant white dorid (Doris odhneri). The former is typically more yellowish with a concentrated cluster of dark spots on its back, while the latter is usually bright white without spots. Both tend to have larger tubercles and therefore a bumpier texture. The ribbon of eggs laid by this species is white, narrow, and laid down in an oval-shaped spiral. 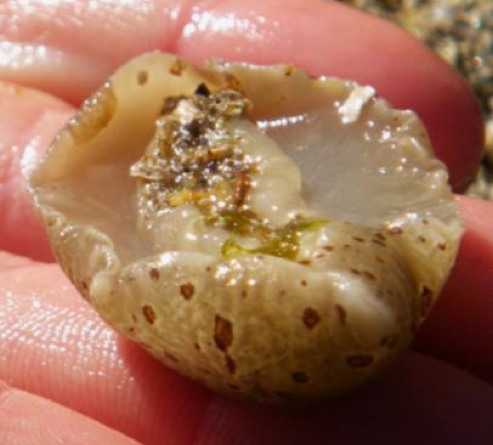 These egg ribbons may be found tucked under rock ledges in rocky intertidal areas.